By Keith Cowing on January 12, 2019 10:52 PM. You have now been caught on a Facebook ad. You arrive at the petition page at watchusfly.com which claims that "Watch U.S. Fly is a community of Americans that believes that America should lead the world in technological advancements. We realize that in order to maintain our edge, American aerospace must have the support of policymakers so they can continue to chart the future." In the lower corner in a small, faint font, it says "Copyright © 2019 Boeing"
"Boeing Services often contain cookies or similar technologies from third-party providers that help us compile statistics about the effectiveness of our promotional campaigns, perform analytics, enable social networking features, and other operations. These technologies enable the third-party providers to set or read their own cookies or other identifiers on your device, through which they can collect information about your online activities across the Services and other, unaffiliated devices, applications, websites, or services... Boeing also enables cookies and third-party tracking mechanisms to collect your information for use in interest-based advertising. For example, third parties use the fact that you visited our Services to target online ads for Boeing services to you on non-Boeing websites. In addition, our third-party advertising networks use information about your use of our Services to help target non-Boeing advertisements based on your online behavior in general... Data collected from a particular browser, app, or device can be used with a linked computer or device. For example, we or our third-party service providers display ads to you on your laptop based on the fact that you visited Boeing Services on your smartphone." Remember, if you visit, its too late unless you have disabled cookies, use a VPN, etc. Most people do not. But if you sign the petition, they got you. Boeing never tells you who they will share and/or sell your data to. Nor do they tell you what these third parties will do with the tracking that they can now do based on your visit to the watchusfly.com site. Political campaigns can buy this information, Boeing can now make pro-Boeing, anti-someone else ads appear on your browser - as you probably know by now. We've taken notice of this creep behavior before (see links below). Boeing is doing a lot of lobbying and targeted media buys these days. This is how big aerospace is using the same shady tactics that skewed the 2016 election for their own, undisclosed purposes. Congratulations, if you visited this stealth Boeing site you have now become part of this ongoing sneaky Boeing effort. By Keith Cowing on November 16, 2018 6:22 PM. Keith's note: NASA has some pretty amazing websites. Some of the best ones are made by JPL. They are immensely popular. A lot of work goes into making sure that they work, that they are accurate, and, if needed, that caveats are posted explaining why the information depicted may be modified, delayed, or missing. In other words, there's a lot of transparency and honesty that goes with thee websites - as there should be. Sometimes the websites have flaws that only emerge over time. Usually NASa is good about fixing these bugs. But sometimes a few NASA employees decide to get snarky and try to blame inaccuracies on the inability of news media or the public to understad a lot of geeky details that they should not be expected to know. 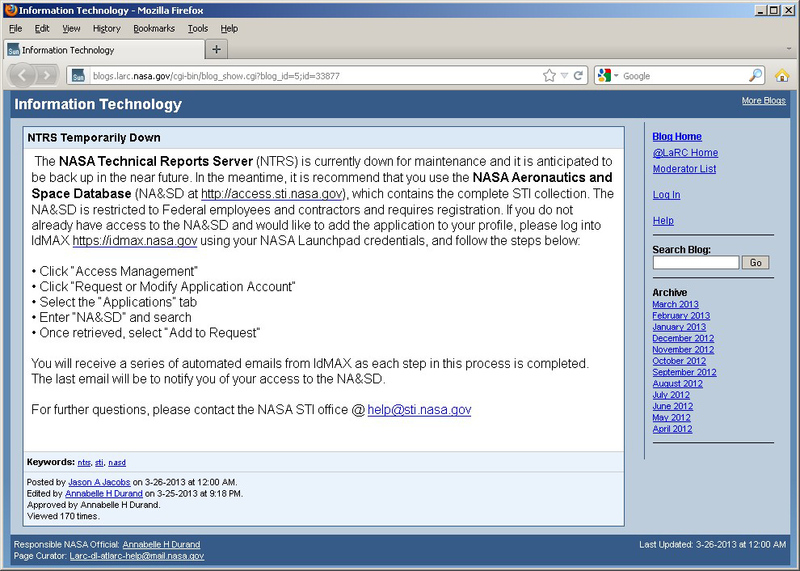 That's not how to behave when it comes to the presentation and maintenance of a "public facing" NASA website. The other day someone at NASASpaceflight.com was sharp enough to notice that there seemed to be a signal coming from a Mars Exploration Rover- specifically via a DSN dish in Madrid, Spain. Their source: the NASA DSN Now website. Since Spirit is dead, Opportunity is the only MER rover left who could do this, right? Indeed on the right hand side of the screen you could see that Opportunity was sending information back to Earth. So, assuming that the NASA website was correct he tweeted his observation. Someone replied to note that the NASA Eyes website showed that there were up and down links from Opportunity. Even the unofficial NASA DSN Twitter account @DSN_Status (which gets its data directly from the NASA Eyes website) said that DSN was talking to - and getting data from - Opportunity. DSS 54 receiving data from Opportunity at 11b/s. Lots of Twitter traffic ensued. I checked with several NASA sources who said that they were checking to confirm and tweeted that this might be a "false positive". A short while later JPL tweeted "Today http://eyes.nasa.gov/dsn/dsn.html showed what looked like a signal from @MarsRovers Opportunity. As much as we'd like to say this was an #OppyPhoneHome moment, further investigation shows these signals were not an Opportunity transmission." And that should have been the end of the story. But it wasn't. NASA JPL employee Doug Ellison, one of the designers of the NASA DSN website, started to complain on his Twitter account @Doug_Ellison about things he does as part of his day job at NASA JPL. He was whining about how people misunderstood what the website was saying. In essence, it was the public and news media's fault for getting things wrong. Among his tweets he chided people by saying "Willing a spacecraft to phone home is awesome. Misinterpreting data (in a way that's been done before) that has people thinking it HAS phoned home isn't." In other words its our fault for believing NASA. I have gotten tweets and emails from people lecturing me how this JPL DSN website works with lots of geeky details. I'm sure everyone is correct. Funny thing: none of what they are saying to me appears on the NASA DSN website. All visitors to this website see is a page showing little graphical dishes sending or receiving animated signas rom spacecraft. NASA tels people to go this website to see what is going on across the solar system. Since NASA is showing this happening as if it was happening in real time, visitors naturally assume that what NASA is showing is real since people trust NASA websites. If this is not a true representation of what DSN is doing then why did NASA go to such lengths to make it look real and not tell people that it is not real. Right now if you go to this website there is no obvious note to people that the data may not be accurate. There is a little "last updated" notation with a time. And there's a little "i" link. If you click on it you get this: "Below is the current state of the Deep Space network as established from available data updated every 5 seconds. Click a dish to learn more about the live connection between the spacecraft and the ground. The legend (below) shows the various connections between spacecraft and the ground. A carrier is a pure radio 'tone' used to establish communications or for navigation. Data is commands, scientific measurements or housekeeping engineering information. Uplink is commands being sent 'up' to a spacecraft. Downlink is data received from a spacecraft." In other words NASA is saying that this is what is actually going on with their DSN. Since NASA websites tend to have a stellar reputation when they show stuff like this, one would naturally assume that if NASA is showing something like this then it is accurate. Based on the obvious flaws in this website's depiction of ghost signals from a Mars rover, NASA JPL needs to put a caveat on their website saying that information on the website may not be accurate. Or take the site offline. This is an official NASA website and people tend to believe what NASA posts online. Faulting people for doing like some JPL people and fans have been doing, is silly. If NASA JPL PAO can take the time to add "artist's impression", "Illustration", or "false color" to graphics they post then they can put a notice on this website stating that "the graphics depicted are conceptual and may not represent actual spacecraft communications". Dialing back the error, what happend? A lot of people were overjoyed to see a NASA website saying that Opportunity had phoned home. They trusted NASA on this. But in the end it was a mistake. Oh well. NASA JPL quickly admitted this. Hopefully JPL will understand that they have engendered an amazing amount of trust among visitors to many of the agency's websites and will adjust this otherwise cool website to inform visitors that glitches happen. They also need to send at least one of their employees to training class for "NASA Public Outreach 101". By Keith Cowing on April 1, 2017 12:35 AM. "MILES O'BRIEN: While scientists wait to see what shoes might drop, a rumor mill echoes across the Twitterverse ... Are scientists in a panic? Is that what it is? What's going on? KEITH COWING, NASA Watch: They know where the panic button is, and they look at it once or twice a day. MILES O'BRIEN: Keith Cowing is a former NASA biologist who founded the watchdog Web site NASA Watch 20 years ago. He's the proto-rogue, and now he says everybody seems to be joining in." Thanks to all of you for stopping by for the past 21 years. By Keith Cowing on May 18, 2016 4:32 PM. "One of the requirements would be that the government develop a streamlined plan for its acquisitions. The bill would increase the power of existing Chief Information Officers (CIO) within federal agencies so that they could be more effective. Each agency would also be reduced to having only one CIO in the agency, who is then responsible for the success and failure of all IT projects in that agency. The bill would also require the federal government to make use of private sector best practices. The bill is intended to reduce IT procurement related waste." "Admittedly, NASA's scores on the FITARA scorecard are unacceptable. We have work to do, and challenges to overcome. But at the same time, I believe it is also important to reflect on the major strides NASA has already taken in improving the management of and protection of the Agency's IT infrastructure. Thus, the remainder of my testimony today will provide a brief summary of our achievements to date, and other work in progress directed at becoming the best stewards of the Agency's IT resources." Keith's note: I have to be completely honest: neither this hearing or the FITARA report/scorecard that was released were on my news radar. I need to thank NASA's AA for Legislative Affairs, Seth Statler, for pointing out the hearing - and NASA's 'F' grade. NASA has the distinction in 2016 for being the only agency to get an overall 'F', so congratulations are in order. Of course, in telling everyone about FITARA, it is quite obvious that Statler was doing a little blame shifting as he spoke for NASA CIO Renee Wynn - while throwing her under the bus. You'd expect the @NASACIO Twitter to say something too but they have not tweeted anything since 15 March 2015. Nor is there any mention of the hearing, the CIO's testimony, the 2016 score card (or last year's), NASA's performance (or lack thereof) and what corrective actions NASA plans to make on the NASA CIO website. Searching for "FITARA" only yields 6 results across all of NASA's websites. This chatty 2016 newsletter from the CIO makes no mention of NASA's abysmal score in 2015 but does say "OCIO has made significant progress in the development of a solid implementation plan." So, as long as they are working on a plan, then everything must be OK. There is a slightly goofy post at Open.NASA.gov (not findable on the NASA search engine) "NASA's Approach to Implementing FITARA" from 10 March 2016 that opens with "My husband and I are planning a vacation to Disneyworld, an awesome destination for our five year old dreamer. How do we budget for such an grandiose trip?" , and then goes on to spout happy talk - with added IT word salad - about how seriously NASA takes FITARA. If only. By Keith Cowing on December 14, 2015 11:00 PM. "The Environmental Protection Agency (EPA) violated publicity or propaganda and anti-lobbying provisions contained in appropriations acts with its use of certain social media platforms in association with its "Waters of the United States" (WOTUS) rulemaking in fiscal years 2014 and 2015. Specifically, EPA violated the publicity or propaganda prohibition though its use of a platform known as Thunderclap that allows a single message to be shared across multiple Facebook, Twitter, and Tumblr accounts at the same time. EPA engaged in covert propaganda when the agency did not identify EPA's role as the creator of the Thunderclap message to the target audience. The agency's #DitchtheMyth and #CleanWaterRules social media campaigns did not implicate the publicity or propaganda prohibition. EPA also violated anti-lobbying provisions though its hyperlinks to certain external Web pages in an EPA blog post. Both of the external Web pages led to appeals to the public to contact Congress in support of the WOTUS rule, which taken in context, constituted appeals to contact Congress in opposition to pending legislation. EPA associated itself with these messages through its decision to include the hyperlinks in its blog post." "I can guarantee you that general counsels across the federal government are reading this report," said Michael Eric Hertz, a professor at the Benjamin N. Cardozo School of Law in New York who has written on social media and the government." "CRISPR was leading Pluto in the Science magazine poll until NASA decided to skew the results by using its 13.5 million follower Twitter account to tell people to vote for Pluto. No doubt the mission's PI will be jumping up and down and crowing about how popular Pluto is when in fact NASA stuffed the ballot box." 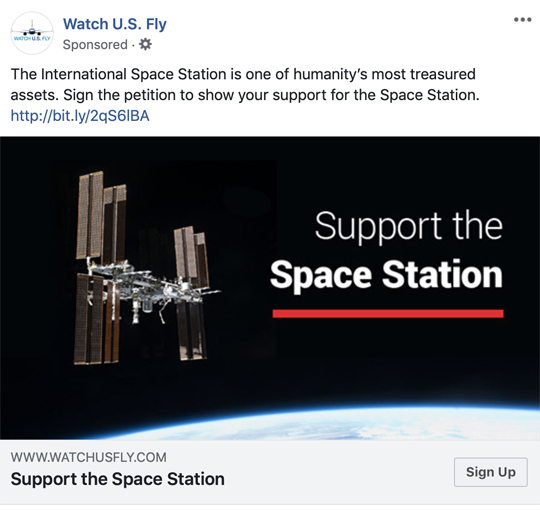 Keith's note: On one hand NASA does a wonderful job of using multiple social media platforms to distribute information about what it does with taxpayer dollars. One the other hand it sometimes tries to tip the balance to affect the perception of what it does on non-NASA websites -- as was the case with the "Breakthrough" poll in Science magazine. Congress wants NASA to explain itself yet it puts forbidding language in legislation to thwart them from doing so. That said, NASA is trying convince everyone that a mission to Mars without funding, an architecture, or a plan - is somehow real by using that #JourneyToMars hashtag in virtually everything it generates these days - even if there is no obvious connection to a mission to Mars. This GAO ruling about whatever EPA was up to is bound to have an impact on NASA. In the end, however, I'm not sure it will be a positive impact. By Keith Cowing on December 9, 2015 1:15 AM. Keith's note: NASA pays lots of money to send the endlessly-talented photographer/videographer Bill Ingalls to Russia - he breaks technology barriers whenever he can - with clear style - yet NASA PAO/NASA Social cannot find a way to link to his live event when he goes to the trouble of offering it? I am truly baffled. 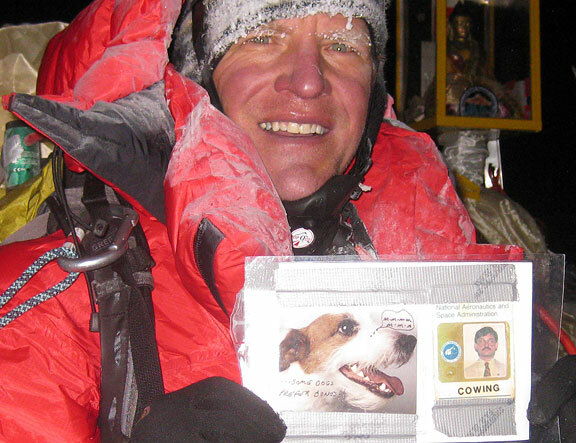 I did this sort of thing live from Everest Base Camp back in 2009. Its not easy but its not hard. Now NASA does it - but stumbles upon itself to find out how to tweet a simple web link? By Keith Cowing on April 20, 2015 10:18 AM. "Based on extensive user feedback and testing, we've modernized NASA.gov to work across all devices and screen sizes, eliminate visual clutter, and put the focus on the continuous flow of news updates, images and videos we know you're looking for. We've simplified our image and video galleries to emphasize viewing and sharing the content, and organized that content around NASA's areas of work, like the Journey to Mars and exploration of the Solar System and Beyond. And we've made the content more "discoverable," by connecting features and images to related content through an "infinite scroll" of similar content and clickable topic labels that take you to pages with more related content." Keith's note: Many people just type "nasa.gov" in their browser - like I do. Try that and see what happens - or click here: http://nasa.gov/. Some (but not all) browsers automatically add "www". Is the NASA OIG Online Hotline Secure? By Keith Cowing on April 17, 2015 9:05 AM. "Got a hot tip about federal waste, fraud or corruption? You should think twice about using the government's own online systems for collecting such complaints. Many of them promise confidentiality but for years have sent sensitive data - including names, addresses and phone numbers of whistleblowers, as well as the details of their allegations - across the Internet in a way that could be intercepted by hackers or snoops. Or, perhaps worse still, by the agencies named in the complaints". By Keith Cowing on May 22, 2014 11:56 AM. "We can say little, if anything, about what these patterns [above] signify, why they were cut into rocks, or who created them. For all intents and purposes, they might have been made by aliens." When a new NASA book on alien communications has a paragraph like that, you better pay attention. Update 2: NASA pulled the book and press release from their site. Now the book is available here, as pointed out by a commenter." Keith's note: Someone found a book "Archaeology, Anthropology, and Interstellar Communication" online at NASA.gov - one that NASA paid for, published, and posted. At one point it off handedly talks about aliens leaving messages on rock. So NASA pulls it offline. Now, people reading the articles that refer to the book get a dead link [update: NASA put the book back online so the link works again]. Well, nothing ever really disappears on the Internet. You can download the book here. Duh. Keith's update: Classic NASA explanation below. NASA should post it on NASA.gov - at the links that news articles have been linking to so that all the people coming to visit the broken link see the real reason. When NASA just pulls things offline with no explanation it simply fuels these sort of stories. Without the original document online no one can see the context that NASA wants you to refer to. So they go with what NASA has left there - a big gapping hole. Continue reading Nothing Disappears From The Internet, NASA (Update). By Keith Cowing on March 4, 2014 12:12 PM. By Keith Cowing on December 12, 2013 12:28 PM. "We all know what distorting incentives have done to finance and banking. The incentives my colleagues face are not huge bonuses, but the professional rewards that accompany publication in prestigious journals - chiefly Nature, Cell and Science. ... These journals aggressively curate their brands, in ways more conducive to selling subscriptions than to stimulating the most important research. Like fashion designers who create limited-edition handbags or suits, they know scarcity stokes demand, so they artificially restrict the number of papers they accept. The exclusive brands are then marketed with a gimmick called "impact factor" - a score for each journal, measuring the number of times its papers are cited by subsequent research. Better papers, the theory goes, are cited more often, so better journals boast higher scores. Yet it is a deeply flawed measure, pursuing which has become an end in itself - and is as damaging to science as the bonus culture is to banking." Keith's note: NASA is completely addicted to the mindset mentioned in this opinion piece. NASA allows itself to have terms dictated to them by Science and Nature as to how and when research news can be released rather than the other way around. Yet NASA has an "impact factor" and "reach" that vastly eclipses anything that these journals can offer. Its time for NASA to grow a spine and tell these journals that NASA is going to set the rules with regard to when and how NASA-funded research is going to be released. By Keith Cowing on December 7, 2013 11:56 AM. Keith's note: The other day NASA sent out media advisories urging news media to cover NASA-sponsored and related events at the Fall AGU meeting in San Francisco from 9-13 December. But as is usually the case NASA cannot seem to coordinate among itself when more than one center is involved. NASA HQ and NASA Ames put out media advisories that state "Briefings will be streamed for registered journalists on the AGU press conference Web page. They will not be carried on NASA Television." The briefings will not be carried on NASA Television." While these events will not be sent out on NASA Television, most people who watch NASA Television on the web do so via NASA's UStream webstreaming accounts. So, why can't NASA's TV page link to these webcasts? Clearly there is some infrastructure in place whereby JPL is able to stream events over UStream. The events listed as being streamed are only JPL-associated events with JPL people involved. Why can't this web streaming hardware be left in place to stream other NASA events? 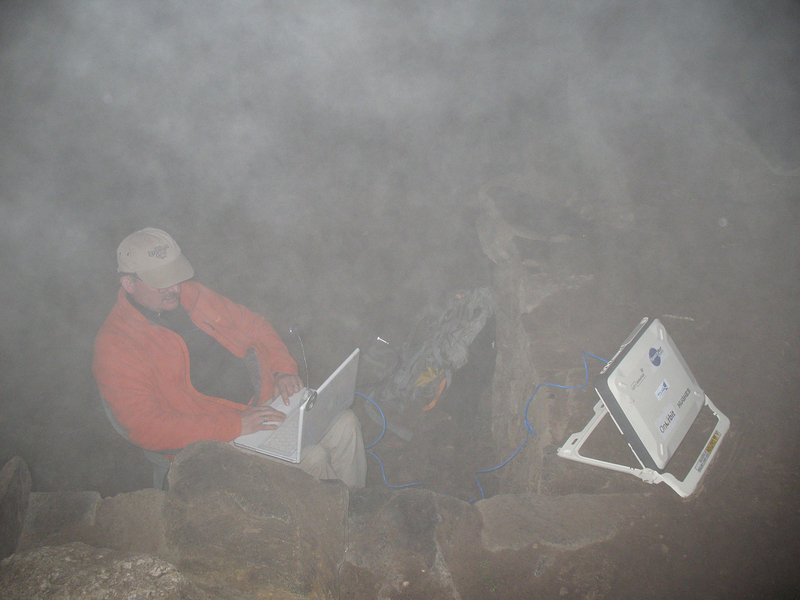 AGU apparenly has a UStream system in place, why can't NASA tap that? More importantly, why didn't JPL PAO tell ARC, HQ, and other NASA centers that this would be streamed so as to make sure that the media advisories that "NASA" sent out were all in synch? Curiously both the JPL and HQ media advisories list Stephen Cole from NASA HQ PAO on them - so there is some level of contact between JPL and HQ PAO - at least on paper. Coles's response to my inquiries on this matter: "confusing, I know, but such is the wonderful world of multimedia color we live in." In other words 'yea, so what'? In addition to these AGU media advisories there is a separate NASA HQ advisory that was put out for a Mars Curiosity radiation briefing at AGU. MSL is a JPL mission. But wait, since no one on the panel is from JPL, JPL is not going to live stream it. But NASA HQ says they will provide an audio stream for news media and the public and JPL makes mo mention of the event or the audio streaming. And you wonder why the agency has 3 (or 4) official MSL websites? Last week NASA SMD held an online Town Hall meeting with the planetary science community to discuss budget issues. Next week at AGU there will be many more of these official NASA-sanctioned events wherein NASA representatives tell attendees (taxpayers too) what the challengers are in the months and years ahead. There is no apparent way for NASA researchers to participate in these Town Hall meetings unless they pay the expense of going to a meeting operated by a third party. AGU claims there is a virtual viewing option (which is confusing to use and tries to charge you $103 for "free" access) that offers free webstreaming but does not allow any interaction - which is odd since its rather simple to enable the chat function on these webstreaming events. I am now told someone is going to "fix" that. Meawhile, media has some access to online NASA press events but that assumes that the AGU decides that you warrant media accreditation. NASA has no input to that process. In summary: instead of having all NASA AGU-related events in one place so as to best inform the news media, scientific community, and public as to what is happening and how to see/participate, NASA's directorates, centers, programs, and Headquarters all seem to be running in a different direction ignoring obvious overlaps, points of cooperation, and ways to utilize limited fiscal resources. By Keith Cowing on November 19, 2013 4:00 PM. "Several space agencies are staging a global media event on Twitter this week to mark the 15th anniversary of the International Space Station. The Canadian Space Agency, NASA, the European Space Agency and JAXA, the Japanese Aerospace Exploration Agency, will launch a worldwide wave on Twitter, beginning at 7 p.m. eastern Tuesday evening. That will be midnight GMT -- the official time zone of the orbiting space laboratory." Keith's note: I guess I missed the NASA announcement on this Twitter event that starts in 3 hours. Indeed, looking at NASA.gov, spaceflight.nasa.gov, nasa.gov/mission_pages/station/, and nasa.gov/connect/social/ I see zero mention of this Twitter event. Baffling. By Keith Cowing on November 13, 2013 8:36 PM. Keith's note: At bottom of this release "Mars Rover Teams Dub Sites in Memory of Bruce Murray", JPL has included "For more information about Opportunity, visit http://www.jpl.nasa.gov/msl , http://www.nasa.gov/rovers and http://marsrovers.jpl.nasa.gov . For more information about Curiosity, visit http://www.nasa.gov/msl and http://mars.jpl.nasa.gov/msl" . Two missions - five websites. First for the Opportunity links. if you go to http://www.jpl.nasa.gov/msl/ you do not get anything on Opportunity but rather its a Curiosity page. If you go to http://marsrovers.jpl.nasa.gov it redirects you to http://marsrovers.jpl.nasa.gov/home/index.html at JPL. If you go to http://www.nasa.gov/rovers it redirects you to http://www.nasa.gov/mission_pages/mer/index.html at NASA HQ. If you go to the NASA HQ rover site it has a link to a JPL rover website at http://marsrover.nasa.gov/home/index.html it does not link to http://marsrovers.jpl.nasa.gov. And http://marsrovers.jpl.nasa.gov is identical to http://marsrover.nasa.gov/home/index.html. So, one of the three links listed has nothing to do with Opportunity. The NASA HQ MER site links to a JPL MER site but it is at a different address than the JPL MER website listed in the release even though the content is identical. Now for the Curiosity links. If you go to http://www.nasa.gov/msl it redirects you to http://www.nasa.gov/mission_pages/msl/index.html at NASA HQ. If you go to http://mars.jpl.nasa.gov/msl you end up at a MSL website at JPL. The NASA HQ MSL site points to the JPL MSL site but the JPL MSL site does not point to the NASA HQ MSL site. So, NASA is paying to maintain two MSL websites and the web addresses they give out are different than the actual web addresses - but they won't bother to put the actual addresses in press releases. Meanwhile, NASA is paying for 2 (or 3) MER websites - and again the links put in the press release are not the actual website address. And a website link that has "MSL" in it is listed as a place to get MER information. In total 5 links are included for 2 missions - and JPL PAO seems to think this is just fine. Meanwhile NASA PAO and SMD have the nerve to moan and complain about lack of education and public outreach funds? They are squandering their money on overlapping websites that don't even coordinate their content or links. I have raised this issue at several SMD media telecons. All they say is "we'll look into it". They don't. They just don't care about being efficient or coordinating. No - they just want more money and refuse to change the way that they operate. Clueless. Oh yes --- did you know that NASA's Constellation Program is building the Altair Lunar Lander that will land on the moon by 2020? Moreover, the Altair will be launched on the Ares V rocket. HEOMD has an incredibly tangled web presence too. - Why Does NASA Maintain Three (Four) Different MSL Websites? By Keith Cowing on March 27, 2013 6:31 PM. "Backed by Intel and Dell, Mirantis has emerged as a clear leader in the OpenStack world heavily promoting and supporting the adoption of the platform originally developed by NASA and Rackspace." "NASA's prestige and participation has been a selling point for advocates of the OpenStack open source cloud project, which NASA co-founded with San Antonio infrastructure-as-a-service provider RackSpace. Unfortunately, they'll have to get along without NASA from here on." By Keith Cowing on March 26, 2013 8:48 PM. But if you try to gain access internally and are a civil servant or contractor you can register and then gain access. But wait, wasn't access by contractors supposed to have been the problem in the first place? Why doesn't a warning appear on the screen that tells contractor employees who are citizens of "China, Burma, Eritrea, Iran, North Korea, Saudi Arabia, Sudan and Uzbekistan" not to bother? By Keith Cowing on March 6, 2013 2:10 PM. "The International Space Apps Challenge is a technology development event during which citizens from around the world work together to solve challenges relevant to improving life on Earth and life in space. Join us in over 75 cities around the world or at home on April 20-21, 2013." Keith's note: At the NASA Advisory Council Committee on Education and Public Outreach meeting on Tuesday, Leland Melvin, the AA for Education at NASA, lamented why people are not promoting the International Space Apps challenge and urged committee members to spread the word. Well ... have a look at the NASA Education website. No mention is made of the International Space Apps Challenge. No mention at the NASA CIO, NASA Open Government, or NASA.gov's calendar either. Yawn. "I think it is inexcusable that NASA has not made more of an effort to promote things such as the International Space Apps Challenge - especially when the White House places such a priority on things like this. There is much risk in this ad hoc and dysfunctional public engagement policy at NASA. Now that the first apps challenge event was such a success, efforts like this could continue - without overt NASA involvement - thus making NASA less - rather than more relevant. If that happens NASA only has itself to blame." Keith's update: Here's a related event that also gets zero mention on NASA's Education website - or on NASA's Space Technology Mission Directorate - the sponsor of the event itself. Dark Side of the Jam: 'On March 8th, game developers around the planet will gather to make games about space and science. The Dark Side of the Jam is open to all, whether you're a veteran developer, hobbyist, or student. Ideally your games will not only be great achievements in coding prowess, but will help capture the public's interest in the real science and technology advancements being made in aerospace exploration. DSJ is an educational project of the Night Rover Challenge. Learn more about this $1.5 Million dollar NASA Centennial Challenge for advanced energy storage technology." Why Does MSFC Point NASAIMAGES.Org At Pictures of Weapons? By Keith Cowing on February 2, 2013 4:38 PM. "NASA and Internet Archive, a non-profit digital library based in San Francisco, made available the most comprehensive compilation ever of NASA's vast collection of photographs, historic film and video Thursday. Located at www.nasaimages.org, the Internet site combines for the first time 21 major NASA imagery collections into a single, searchable online resource. A link to the Web site will appear on the http://www.nasa.gov home page." Keith's note: If you go to www.nasaimages.org you will see that it is no longer totally dedicated to NASA content as this 2008 press release states. It used to look like this. Instead it redirects visitors to http://www.dvidshub.net/unit/NASA i.e. the Defense Video & Imagery Distribution System which is mostly about guns, tanks, war, weapons, etc. This website is apparently operated by U.S. Army/USARCENT (Third Army). What is really odd is that the domain nasaimages.org is still registered to NASA - MSFC to be specific. Here's the current registration info. This makes no sense whatsoever. NASA has never bothered to explain this. By Keith Cowing on August 7, 2012 12:26 PM. "NASA may only consume0.5 percent of the federal budget, but it generates practically all of Uncle Sam's viral marketing buzz.Never was that more apparent than on Monday morning following the successful Mars landing of Curiosity, the biggest and most advancedspacecraft ever dispatched to another planet. In an explosion of tweets, Tumbls, status updates, and blog posts, the Internet showed its love of NASA in a way other parts of the government could only dream of. So what's NASA's secret?" By Keith Cowing on July 15, 2012 8:14 PM. "In the existing infrastructure without our delivery partners, NASA may have to cap the number of visitors and hours of web streaming coverage or eliminate it entirely for particular peak activities. This would force visitors to seek content from other venues that may or may not cover NASA missions. To avoid this situation, NASA seeks to broaden its ability to reach new audiences and numbers of people through access to multiple venues." By Keith Cowing on April 25, 2012 10:40 PM. Keith's note: One night in January I got frustrated trying to find something on NASA's Human Spaceflight website(s). So, I decided to map them. As you can see from this chart (enlarge), NASA's HSF web presence - like much of NASA's sprawling cyber infrastructure - is an unorganized mess. Yet despite this convoluted web structure, people often manage to find things simply because a lot of what NASA does is so compellingly cool. People find this stuff despite the convoluted and confused way that NASA organizes things (Google). As I have already noted, most missions at NASA have two, often three (or more) official websites and web addresses. The websites are often out of synch with each other and yet also duplicative - at the same time. NASA also has multiple entry points for the same topic, dead ends, and pages that reflect programs that are dead. I sent this chart over to NASA. They agreed: its a mess. 5 months later. No change. So I thought I'd share it with y'all. By Keith Cowing on April 3, 2012 1:02 PM. "This memorandum reinforces NASA policy regarding the protection of Sensitive but Unclassified (SBU) information. The memorandum applies to all Centers, Mission Directorates and their supporting commercial contractors that process NASA information. Individuals responsible for handling SBU information should be cognizant of the requirements outlined within this memorandum to ensure the protection of all SBU data." By Keith Cowing on October 7, 2011 2:11 AM. 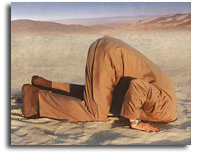 Keith's note: I have posted questions for Beth Beck at HEOMD, sent email requests, and yet no one has responded. Based on previous dysfunctional interactions with HEOMD (SOMD and ESMD) I have to conclude that my requests are being ignored - on purpose. Yawn. Oh well, this is not exactly a new behavior on NASA's part. So much for the openness and transparency policies established by the White House that the Open.gov folks love to brag about. NASA seems to think it is exempt. I guess it is time for a bunch of old-fashioned FOIA requests. And yes Beth, I will FOIA your complaints about me to the OGC, etc. By Keith Cowing on August 2, 2011 4:15 PM. "The site is a collaborative blog for the open government community to highlight the ways that transparency, participation, and collaboration are being embraced throughout the agency. "NASA is committed to experimenting with and embracing new participatory ways of collaboration," said Linda Cureton, the agency's chief information officer. "The launch of open.NASA is a new chapter in NASA's culture of openness and an exciting new way to engage citizens in our activities." By Keith Cowing on March 30, 2011 12:30 AM. "NASA will host a summit about open source software development on March 29-30 at the agency's Ames Research Center in Moffett Field, Calif. The event runs from 9 a.m. to 5 p.m. PDT on both days. NASA's first Open Source Summit will bring together engineers, policy makers and members of the open source community. Participants will discuss the challenges within the existing open source policy framework and propose modifications to facilitate NASA's development, release and use of software." Register as a remote participant. Live streaming of the event can be found here. By Keith Cowing on August 3, 2010 2:22 PM. "The use of Web 2.0 tools can significantly enhance NASA's ability to communicate with employees and the public about its mission. The purpose of this memorandum is to provide guidance to NASA civil service and contractor employees regarding the use of these Web technologies to facilitate collaboration and information sharing within NASA. These Web technologies include tools such as wikis, blogs, mash ups, web feeds (i.e., Really Simple Syndication and Rich Site Summary (RSS) feeds), social networking sites (e.g., Facebook), and forums, which are often collectively referred to as Web 2.0. Using social media in a professional capacity (e.g., creating a Twitter feed for a mission) is an example of an official NASA communication. The informality and enforced brevity of such media notwithstanding, NASA personnel using Web 2.0 tools are representing the agency, and their communications must be professional and factually accurate." Keith's note: An example of the implications of this policy: those of you who have Twitter accounts that you use to relay information about NASA can no longer block people from following you. You need to be open and transparent about the information you relay as a NASA employee (civil servant and contractor). If you cannot refrain from Twittering about both personal and work-related stuff then a remarkably simple solution is to get another Twitter account for your personal use. By Keith Cowing on July 19, 2010 7:55 PM. "The core technology developed for NASA's Nebula cloud computing platform has been selected as a contributor for OpenStack, a newly-launched open source cloud computing initiative. It will pull together more than 25 companies to play a key role in driving cloud computing standards for interoperability and portability." 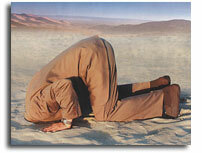 "Torlini acknowledged the concerns that many users have about security in the cloud. However, he said freeing up the code would present more opportunities to improve security. He also stressed that this shouldn't be seen as purely a Rackspace initiative, "Everyone is welcome to contribute," he said." "The new OpenStack project will power NASA's own Nebula cloud and puts new pressure on Eucalyptus, as well as Amazon's EC2 and the whole Hadoop ecosystem. The system is being released under an Apache 2 license." By Keith Cowing on May 27, 2010 2:56 PM. "NASA announced Thursday it has joined the World Wide Web Consortium (W3C). The consortium is an international organization that develops protocols, standards and guidelines to ensure universal Web access. "Standards will play a key role in making NASA's content more accessible on the Internet and in the implementation of our Open Government plan," said Chris Kemp, chief technology officer for Information Technology at NASA Headquarters in Washington. "Additionally, standards nurture technology innovation. We are especially interested in participating in those areas where NASA's ongoing technical requirements overlap with the W3C's standardization efforts." By Keith Cowing on May 6, 2010 10:28 PM. "The challenges to government's adoption and participation in open-source communities is often thought to be a simpe culture clash, but in reality it goes deeper than that, accordning to NASA's newly-appointed chief technology officer. "The issues that we need to tackle are not only cuture, but beyond culture," said Chris Kemp, formerly chief information officer at NASA's Ames Research Center in Moffett Field, Calif. "And I think we need new policy and support from the administration and Congress to help us tackle" them." "NASA Chief Information Officer Linda Cureton announced Chris C. Kemp as the first NASA Chief Technology Officer, or CTO, for Information Technology, a new position established to lead IT innovation at the space agency." By Keith Cowing on May 5, 2010 1:19 PM. Keith's note: NASA civil servant Nick Skytland is one of the Education and Public Outreach Officers for NEEMO-14. He is overtly using his Twitter account for the performance of his official duties - yet he still blocks specific taxpayers from following his postings. I have to wonder when NASA CIO Linda Cureton will finally put a social media policy in place at NASA that deals with such flagrant abuses of one's position as a NASA employee. By Keith Cowing on April 19, 2010 9:24 PM. "Like the Senate bill introduced in 2009 by Senators Lieberman (I-CT) and Cornyn (R-TX), H.R. 5037 would unlock unclassified research funded by agencies including: Department of Agriculture, Department of Commerce, Department of Defense, Department of Education, Department of Energy, Department of Health and Human Services, Department of Homeland Security, Department of Transportation, Environmental Protection Agency, National Aeronautics and Space Administration, and the National Science Foundation." By Keith Cowing on April 19, 2010 9:20 PM. By Keith Cowing on March 25, 2010 11:51 AM. "Nebula is 18 months old and is literally rolling along. Agencies across the federal government are exploring cloud computing, but NASA's work in the area could be become the poster child for its use. Their Nebula Cloud Computing Platform at the Ames Research Center in California is being touted as a possible model for others. Chris Kemp, chief information officer of NASA Ames, explains the benefits of Nebula. "The real thrust of the project was making it easier for NASA to make its data accessible on the Web. NASA started using the Internet long ago, and, as a result, we have thousands of public-facing Web sites, and in today's environment, that's expensive to operate. It's also a large attack surface from a security perspective. We're trying to make it easier and more secure for NASA data to be accessed by our partners and the public." By Keith Cowing on March 8, 2010 11:00 PM. "NASA is seeking input on the creation of the NASA Open Government Plan. As outlined in the Open Government Directive, this brainstorming tool is a mechanism gain input on how to make the key principle of openness a meaningful pillar of NASA's mission, and how to implement participation, transparency and collaboration activities such that NASA becomes more relevant, efficient, and accountable. Key ideas and suggestions developed through this process will be prioritized in the NASA Open Government Plan." By Keith Cowing on January 30, 2010 4:24 PM. "... the software upgrade that made it possible is pretty impressive. The system, which NASA calls the Crew Support LAN, taps into existing communications links -- a Ku satellite band with 3 megabits/sec upstream and 10 megabits/sec downstream -- to give astronauts Web access, along with the ability to better communicate with family and loved ones during their long stays on the space station. All that while traveling at 17,300 mph some 250 miles above the Earth." By Keith Cowing on January 30, 2010 2:10 PM. "Check out the free NASA Images iPhone App, a window to the content available on nasaimages.org. With the app you can access the entire NASA Images library from your iPhone along with the metadata for each image, video, and animation." By Keith Cowing on November 18, 2009 6:50 PM. "It's not just NASA that's hip to the social media game anymore. Now, the Russian space agency Roscosmos has one of its own blogging from the International Space Station." "In the photo I'm holding the latest gadget developed by our military. The device works in two modes. One allows eavesdropping on our colleagues in the American segment. You can get into the FCB (Functional Cargo Block - ed.) and record all their conversations. Also, the device can be used for martial arts training - to be prepared for an alien attack on the Russian segment of the ISS." By Keith Cowing on November 10, 2009 5:24 PM. Keith's note: This page just appeared at NASA.gov about new NASA PAO AA Morrie Goodman. Oddly, no press release was issued about his arrival at NASA or of Alan Ladwig's move to be one of his two deputies. Keith's earlier note: MorrieStory, the Twitter account for NASA's new AA for PAO, Morrie Goodman, does not follow a single NASA Twitter!! Tsk Tsk. Maybe he needs a few followers to urge him on ... You can friend him on Facebook too. By Keith Cowing on October 30, 2009 10:27 AM. "Indiana University has received more than $1.8 million from the National Institutes of Health to collaborate on a $12.2 million, seven-university project designed to network researchers around the country. While the proposed new networking system will contain authentication mechanisms to protect sensitive data and intellectual property, it is being described as a Facebook for scientists." "The new system will federate information about faculty and staff from institutional repositories, listings of published articles from academic publishers, and information provided by researchers. Using Vivo, users can search the information and assemble it on a unique page." Keith's note: Too bad NASA can't do this. Spacebook (internal NASA access only) doesn't really count since only NASA employees inside the firewall can see it - and other field centers have their own competing systems. Taxpayers are denied access. If this sort of information were out in the open, in an easy to use format, not only would NASA and NASA-funded personnel have easier access to what eaveryoen was doing, but so would the taxpaying public. Indeed, this might even lead to unexpected avenues of collaboration between NASA and the outside world. I think every employee at NASA - from Charlie Bolden to maintenance workers - civil servants and contractors alike - should be required to have and maintain a Facebook Page. Nothing fancy - just who they are and what they do. Performance plan, job description, and recent publications etc. You can set these things up in an hour or less and tweak them when need be. If they want to make it fancier beyond that - great. No need to make it their personal page - they can do that elsewhere. I am talking about a professional page. In addition to making NASA more open to various search engines, this might also serve to enlighten policy makers and the public as to what vast range of things NASA actually does, how real (and normal) the NASA family actually is, and that they are a part of the economy - and society - just like everyone else. Right now most of what NASA actually does is hidden behind a firewall in a black box with PAO as the only one with a key. Ever Wonder Why Some NASA Websites Are Stale? By Keith Cowing on July 2, 2009 7:00 PM. "General Note - Web sites shall be reviewed yearly for public web sites and every three years for all other web sites by the RNO for the web site. This review shall be reflected by renewal of web site registrations in AWRS. Policy and content reviews shall be performed yearly for public web sites and every three years for all other web sites by Center subject matter experts tracked by AWRS as required by the Agency and LaRC Office of Chief Information Officer (OCIO). Any violations of these policies and content restrictions constitute grounds for removal of the web site from the LaRC Network. The RNO for web sites that do not meet established guidelines will be contacted and informed of necessary changes. Failure to incorporate required changes within 30 days will necessitate removal from the LaRC Network." Keith's note: Typical NASA: come up with a convoluted multi-step process to develop websites - one that requires many people to complete and approve, tolerates long lag times for compliance, and then allows the websites to sit for years before anyone is required to check to see if they still work. By Keith Cowing on March 24, 2009 6:52 PM. "This proposed procurement is a continuation of an existing contractual agreement for the developed prototype NASA Student Ambassadors Virtual Community (NSAVC) web site. ... NASA HQs intends to issue a Sole Source Procurement to the Omni Media Cast Technologies, LLC to continue performance for the NASA Student Ambassadors Virtual Community web communication tool. ... Interested organizations may submit their capabilities and qualifications to perform the effort in writing, by FAX or E-Mail, to the identified point of contact not later than 11:00 a.m. (EST.) on April 1, 2009. Such capabilities/qualifications will be evaluated solely for the purpose of determining whether or not to conduct this procurement on a competitive basis. A determination by the Government not to compete this proposed effort on a full and open competition basis, based upon responses to this notice, is solely within the discretion of the government." Editor's note: Wow. One full week to determine "whether or not to conduct this procurement on a competitive basis." That is not exactly expending much in the way of effort to conduct a meaningful evaluation. NASA clearly wants to sole source this and not waste any time, it would seem. Also, how can other interested organizations even provide a credible response when this virtual community is not even available for their inspection? Neither are any requirements for the operation of this "virtual community" provided. Curious. By Keith Cowing on September 4, 2008 12:24 AM. "Glasgow-born Gary McKinnon, 42, who last month lost his appeal against extradition, could face life in jail if convicted of accessing 97 computers. His lawyer Karen Todner said his human rights would be breached if he did not return to the UK after a trial." "McKinnon, an unemployed systems analyst from north London, admits accessing 97 US military and Pentagon computers, but claimed he was looking for UFO files. The US government accuses him of stealing passwords and deleting files. McKinnon faces up to 70 years in prison if he is found guilty." Editor's note: I am not certain why this guy is worried. If he is found guilty of attacking American government computers, his alien lawyers can just beam him out of the courtroom up to the Mothership - which the Shuttle will soon be unable to reach. He'll be at home anyway - since it seems that all of the aliens I see on TV have British accents. By Keith Cowing on July 25, 2008 11:20 AM. By Keith Cowing on July 17, 2008 3:26 PM. "Although we could not specifically validate the authors' level of awareness, none of the four Centers had active programs designed to educate new employees or to periodically brief existing employees about the STI review requirement. The effectiveness of NASA's STI review process could be improved if STI authors are timely notified of the results of the STI review and if NASA took steps to ensure STI authors are aware of their responsibilities under NPR 2200.2B. Those actions would remove uncertainty from the process and further reduce NASA's risk of inappropriately releasing restricted or sensitive STI." By Keith Cowing on June 26, 2008 3:44 PM. "On Wednesday, July 23, NASA will host an Industry Day to discuss upcoming agency-wide acquisitions for the Information Technology (IT) Infrastructure Improvement Program, or I3P. The program strategically will procure information technology infrastructure services for NASA." "NASA will NOT conduct an open Question and Answer session as a part of this meeting." By Keith Cowing on June 13, 2008 12:48 PM. Editor's note: WayneHale Is now Twittering. He has 16 followers. Maybe he will add a few more. Update: in 2 hours he more than doubled his number of followers. Oh yes MarsPhoenix currently has 20,057 followers. CNNBreaking News has 21,667 followers. Soon Phoenix may be more popular than CNN on Twitter - and will have done so in mere weeks. "What better way to reach a multi-tasking, short-attention-spanned Gen Y'er than to limit your messages to 140 characters? I think my favorite NASA Baby Boomer reaction to Twitter (a micro blogging tool that lets you send 140 characters to subscriber's Instant Messaging programs or cell phones) is, "Well, there is a technology that solves a problem I don't have." Editor's note: Yawn, yet another example of someone parsing new Internet capabilities (such as Twitter) into false dichotomiesas belonging to either Gen Y or Baby Boomers. This is getting old. Look at the most popular Twitter feeds. I can see a large number of authors/topics whose feeds are most certainly NOT being authored by someone from Gen Y. Can't we all just get along and use these tools without applying an inaccurate litmus test? By Keith Cowing on June 3, 2008 2:50 PM. "Employers seeking to decrease interruptions may want to have their workers use instant messaging software, a new study suggests. A recent study by researchers at Ohio State University and University of California, Irvine found that workers who used instant messaging on the job reported less interruption than colleagues who did not." By Keith Cowing on June 3, 2008 11:40 AM. "A spokeswoman for the Phoenix Mars Lander mission says a hacker took over the mission's public website during the night and changed its lead news story. Spokeswoman Sara Hammond says a mission update posted Friday was replaced with a hacker's signature and a link redirecting visitors to an overseas website." By Keith Cowing on June 2, 2008 4:01 PM. "Regardless of the aforementioned Space Act standards, we otherwise found that the Agency mismanaged this activity insomuch as it occurred over a sustained period of time until senior management was eventually alerted by congressional staff and the media. That senior management did not know before then was emblematic of ineffective internal management controls such as a dispute resolution mechanism between contributing scientists and public affairs officials. This is especially true in that relations between NASA's climate change science community and the NASA Headquarters Office of Public Affairs had somehow deteriorated into acrimony, non-transparency, and fear that science was being politicized--attributes that are wholly inconsistent with effective and efficient Government. The investigation also uncovered that one of the underlying contributing factors of these problems may have, in fact, been in the very structure of the NASA Headquarters Office of Public Affairs, where political appointees were placed in the seemingly contradictory position of ensuring the "widest practicable" dissemination of NASA research results that were arguably inconsistent with the Administration's policies, such as the "Vision for Space Exploration." Continue reading NASA OIG Slams PAO Over Hansen Affair. By Keith Cowing on June 2, 2008 12:00 PM. Editor's 31 May 11 pm EDT update: The MarsPhoenix Twitter feed now has 11,667 followers whereas the Twitter feeds for Twitter's Co-founder Biz Stone only has 11,178, Stephen Colbert has 10,593 followers, and Gen Y techie favorite Wil Wheaton (Star Trek actor) has 11,270 followers. Editor's 1 June 12 am EDT update: One hour later and there are now 12,119 followers. That's nearly a 5% increase in just one hour. Editor's 1 June 12 pm EDT update: Now up to 13,970 followers. Twitterholic now ranks it at 20th most popular. Editor's 2 June 12 am EDT update: Now up to 15,038 followers. While the Twitterholic ranking has not been updated, this number of followers would rank it at around 14. At this growth rate MarsPhoenix will break into the top ten in a matter of days - and all of the great science news has just started to arrive. Editor's 2 June 12 pm EDT update: Its now up to 15,626 followers. Twitterholic shows it ranked as the 14th most popular Twitter feed. Next big hurdle: passing CNN Breaking News (cnnbrk) with 20,330 followers. Continue reading Mars Phoenix Surges In Twitter Popularity. By Keith Cowing on May 29, 2008 12:27 AM. "Earlier this month, NASA revealed that it will deploy a 20,480-core Altix ICE supercomputer from SGI at its Ames Research Center in Silicon Valley this summer. Capable of 245 trillion operations per second (Teraflops), the supercomputer will support future NASA projects, chiefly manned missions to the moon and potentially to Mars." "Open source is such a natural for government agencies, it should come as no surprise that NASA is now developing an open-source project called CosmosCode. The goal? "To provide a common access point for individuals, academics, companies, and space agencies around the world using, contributing to, or supporting re-usable, modular, extensible, or standards driven space exploration software." By Keith Cowing on May 28, 2008 1:01 AM. "I am excited about the future and I enjoy talking about what we are doing and where we are going with the Nation's space program. What resonates with the general public the most is the combination of the inspiration from our space exploration missions with the examples of how NASA-derived technologies are critical for life here on Earth. After my keynote in San Jose, several individuals said my speech was "powerful" and that is such a compliment because now they "get" it and are re-energized in their interest in America's space program. As my staff says, the speeches I give are getting better. I am an introvert by nature and I have stepped way out of my comfort zone, but I feel it is extremely important to discuss the importance of NASA to the general public." By Keith Cowing on May 28, 2008 12:07 AM. "A NASA employee has been suspended for soliciting donations and writing politically partisan blog posts and sending e-mail messages while at work, violations of the Hatch Act." By Keith Cowing on May 16, 2008 4:00 PM. Editor's note: I got a Twitter note an hour or so ago from someone@arc.nasa.gov: "reference to nasawatch at the all-hands - how folks use that more than insidenasa." Interesting. I am curious to see how the new inside-the-firewall NASAsphere system works. Does anyone have a screen grab they can send me of NASAsphere that they can share? This is what InsideNASA looks like today. Editor's update: this is a screen grab from NASAsphere. I have learned that this is not a permanent NASA feature - at least not yet. It is undergoing an evaluation period for the next month or so. At that point a decision will be made whether to go ahead - and what software platform to use. Today's Video: Servers Are Our Friends. They Want to Serve Us. By Keith Cowing on May 9, 2008 2:49 PM. "JPL has an inventory of about 19,000 computers, ranging from Windows and Macintosh desktops, to 1,000 node compute clusters. Of these 19,000 computers, about 5,600 are computer servers performing a wide variety of computing tasks. The space requirements of this diverse server population are exceeding JPL's capacity, and plans to add many new computing capabilities over the next few years means that the Lab needs to consolidate its computing footprint both through hardware consolidation, as well as the use of virtualization tools." Continue reading Today's Video: Servers Are Our Friends. They Want to Serve Us..
By Keith Cowing on May 9, 2008 12:30 PM. Continue reading Fixing NASA IT. By Keith Cowing on May 6, 2008 10:57 AM. NOMAD Status: WELLCOME TO THE NEW NASA WEBMAIL WARNING!!!!! If you get an e-mail with "WELLCOME TO THE NEW NASA WEBMAIL" in the subject line, DO NOT provide the information this e-mail is asking for. This is a bogus e-mail that needs to be deleted and ignored. We are working to block this e-mail from NOMAD customers." Editor's note: Hmmm - this is from NOMAD after all. How do we know that this alert is not fake and that the original message is actually legit? Isn't NOMAD supposed to prevent this from happening in the first place - or did NOMAD cause it to happen? Yes I am being silly. I just can't shake the 40 year old mental image of the "NOMAD" robot from Star Trek and the voice that it used every time I read a NOMAD Update. Perhaps someone could forward the offending email text to me? By Keith Cowing on May 6, 2008 8:16 AM. "The CORE Security Team released an advisory to the Full-Disclosure mailing list today that documented a stack overflow in NASA's Common Data Format libs. Looking at this bug, the tech details aren't overwhelming, I think I'm mostly excited about it due to the high profile of hacking NASA libs. One can hardly fault NASA though, I mean, our government can't even get them enough money to do some real space exploration, it's hard to fault them for missing some security issues." "The libraries for the scientific data file format, Common Data Format (CDF) version 3.2 and earlier, have the potential for a buffer overflow vulnerability when reading specially-crafted (invalid) CDF files. If successful, this could trigger execution of arbitrary code within the context of the CDF-reading program that could be exploited to compromise a system, or otherwise crash the program. While it's unlikely that you would open CDFs from untrusted sources, we recommend everyone upgrade to the latest CDF libraries on their systems, including the IDL and Matlab plugins. Most worrisome is any service that enables the general public to submit CDF files for processing." By Keith Cowing on April 30, 2008 7:00 PM. Editor's note: Comments? Send them to nasawatch@spaceref.com. Comments below. Reader note: "Mr. Cowing, A couple of things regarding the Gen Y pitch you posted on NASAWatch on 4/25/08, just for the heck of it. First, I found this item "Why Generation Y is broke" linked on InstaPundit earlier today - you may find it interesting if you haven't already read it. Continue reading Gen Y SMC Pitch Feedback. By Keith Cowing on April 28, 2008 5:22 PM. "In this out-take from PSFK Conference New York, Andrew Hoppin talks about the moment when NASA decided that they needed to open up and collaborate more with their partners and the community in Silicon Valley, they were faced with the challenges of 'home-land' security and red-tape." By Keith Cowing on April 25, 2008 8:07 PM. - Providing the current NASA workforce with infusion of fresh ideas, methodologies and technologies. - Providing the Next Gen NASA workforce the programs and experience today that it needs to be the leaders in the future. 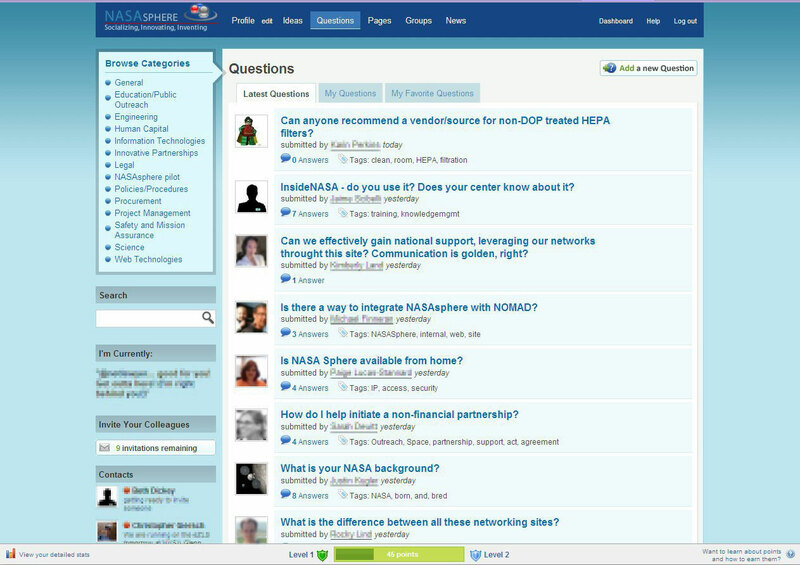 - Enabling enhanced communication and collaboration between NASA centers. - Getting more young people in the door." By Keith Cowing on April 2, 2008 5:48 PM. NOTE BODY: The Office of Strategic Analysis and Communications Ares integration team created a YouTube ID for Ares video content and researched technical specifications and procedures for uploading video content to YouTube. This is part of an outreach into new media to engage the interest of Generation Y in NASA's work. Editor's note: They certainly can make something that just about any kid in grammar school can do these days (i.e. "click to upload") sound very formalistic and technical. Ah, NASA. NOMAD Outage: How did It break? I dunno. How did you fix it? I dunno. By Keith Cowing on April 1, 2008 2:43 PM. "Tuesday, April 1, 2008 - 9:30 AM Central - Goodlink Outage (March 25-27, 2008) At this time a root cause for the issue that caused the outage is undetermined. The NOMAD Team is waiting for additional information from Good that will hopefully pinpoint the root cause. The team did several things to correct the issue but it is undetermined which action or the combination of actions corrected the problem.- deleted corrupted cache files, moved the Good admin account to another server, deleted old mapi profile." NOMAD: A Step Forward - or Backward? By Keith Cowing on March 29, 2008 10:12 AM. 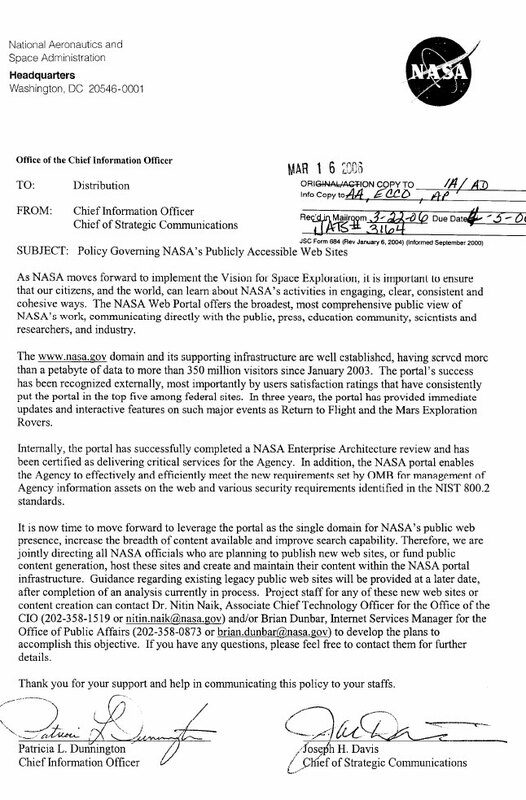 Reader note: "I haven't seen much coverage of NASA's NOMAD (email/exchange server) implementation bringing ALL of NASA into one centralized email system. Some effects have been to have messages sent from the NASA Administrator classified as spam. It has also caused very large volumes of email (hundreds of thousands of non-spam messages) from non-NOMAD servers be delayed for hours on many separate occasions. Recently, GSFC center director Ed Weiler sent a broadcast message to ALL GSFC employees about a sudden all-hands meeting concerning his move back to NASA HQ. This message was received after the event by most NOMAD integrated staff, while those few not yet migrated into the new system received the email within seconds. Only those staff who were telephoned about the meeting were able to attend. In effect, this has caused huge numbers of NASA employees and contractors to use gmail or some outside email service as their reliable form of communication. In addition what used to be relatively free is now costs about $25/month/user to fund only 200 Mb of email storage space. A huge step down not counting the reliability issues." Continue reading NOMAD: A Step Forward - or Backward?. By Keith Cowing on March 5, 2008 1:35 PM. Editor's note: The following is from a NASA Watch reader in regard to the recent GEN Y posting. Personally, I belive that this person's attitude is an example of why many parts of the NASA family are becoming further isolated from the real world - as opposed to becoming more closely aligned to it. My biases aside, this person's comments do represent a viewpoint prevalent at NASA - and that viewpoint needs to be heard. Other reader comments follow. Send yours to nasawatch@spaceref.com. "Keith: Just wanted to provide some feedback to you as a NASAWatch reader and contractor out of Houston regarding the stories about the "Gen-Y" presentation. Although I did not attend the NGAC at Ames, I was invited and my civil servant "counterpart" did attend. I have read the Gen-Y presentation and reviewed your articles. Personally, I find the entire "Gen-Y" discussion quite pathetic. This is one of those times where I wish I was *not* part of the group, as I really do not think there was much substance to the presentation. I've seen better presentations in powerpoint from children in middle school. Truly, as someone born in 1980, I wish I was born a little earlier so I could be "Gen-X" rather than Y. Continue reading Gen Y and NASA: An Alternate View. By Keith Cowing on December 4, 2007 2:56 PM. "The National Aeronautics and Space Administration (NASA) has enjoyed a long-standing, successful relationship with Entrust, Inc. . Now, that partnership grows even stronger as NASA deploys Entrust solutions to unify their security strategy across all sites and field offices in support of its "One NASA" and HSPD-12 initiatives." Editor's note: When I go to http://www.onenasa.gov/, I find that no such website exists. Yet if I go to http://onenasa.com/ it exists, but a password is needed to enter. OneNASA.com is owned by website development firm named ninthdegree.com. If I use the Nasa.gov search engine no URL with "OneNASA" appears in the search results. So, does this "OneNASA" entity actually exist? if so, what does it do? Editor's update: I guess some folks haven't gotten the message yet: OneNASA is dead. 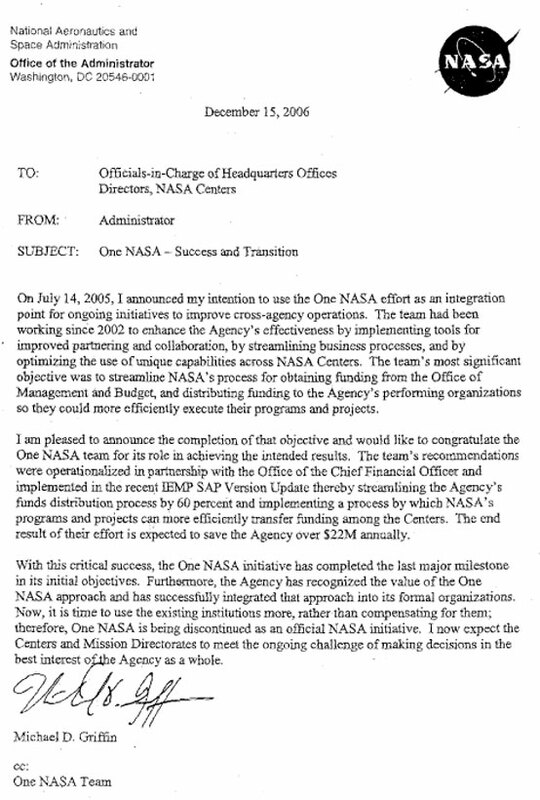 According to this 15 December 2006 Internal memo titled "One NASA - Success and Transition" from Mike Griffin: "With this critical success the One NASA initiative has completed the last major milestone in its intial objectives. Furthermore, the Agency has recognized the value of the One NASA approach and has successfully integrated that approach into its formal organizations. Now, it is time to use the existing institutions more, rather than compensating for them; therefore, One NASA is being discontinued as an official NASA intitiative." By Keith Cowing on December 4, 2007 1:41 PM. "The site, introduced over the weekend, has new blogs and widgets and more ways for people to view and manipulate content. A MyNASA feature has a "top playlist" that lets people watch clips of the space shuttle Discovery's return to Florida or the California wildfires viewed from orbit." "NASA.gov got a face lift over the weekend. It went from black text in gray boxes, to glowing blue icons, roll-over sliding windows, and an elegant nebula backdrop. The update, the first major renovation since 2003, is designed to reach out to the 18-25 demographic (that has been the hardest for NASA to engage) and to appeal to the tech-savvy visitor." By Keith Cowing on November 8, 2007 11:11 AM. 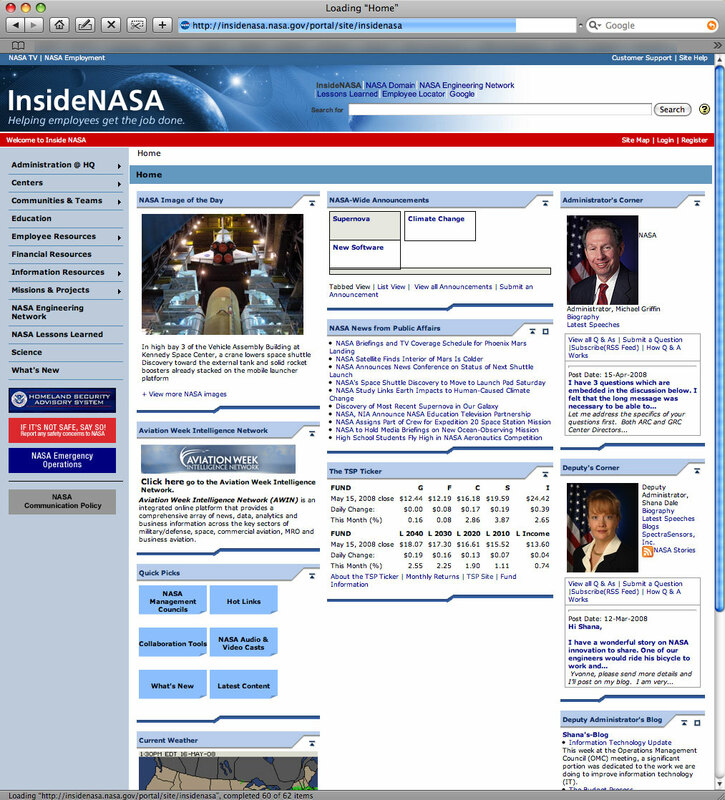 Internal NASA memo: New NASA Web Site Design Coming! 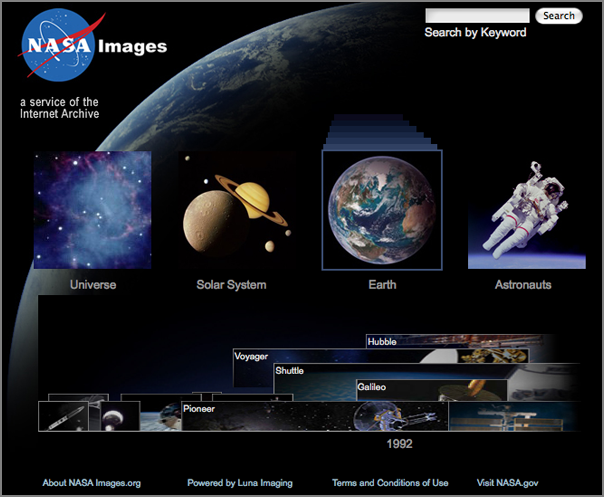 "You are invited to preview the redesigned Web site www.nasa.gov, scheduled to go live Nov. 30. To access the new design, nasa.gov 5.0, visit: http://staging1.cms.nasa.gov/templates/home.html More than a graphic facelift, nasa.gov 5.0 will offer users a new level of interactivity: the opportunity to comment on selected agency stories, for example, or to create a personal play list of favorite NASA videos, or to share NASA content with others via social book marking sites such as Digg and del.icio.us. ..."
By Keith Cowing on October 18, 2007 5:50 PM. "Of key interest are the plans for the first annual NASA Science Web Federation Workshop November 13th-16th, 2007, at Ames Research Center. The intent is for this workshop to focus on NASA application of web technology. You may want to participate as an observer or share your solution to a particular challenge." By Keith Cowing on October 11, 2007 2:51 PM. "NASA has suffered from a public credibility crisis in recent years due to perceived incompetence, a failed mission to Mars, the damaged and dormant Hubble telescope, and its inability to procure a long enough USB cable to reach all the way over to engineer William Chen's cubicle. But NASA officials argue that a secure high-speed line could prevent disasters such as a 2005 incident in which an employee attempting to download the movie trailer for Cheaper by the Dozen 2 crashed the Mission Control Center mainframe computer for two weeks." By Keith Cowing on October 4, 2007 6:56 AM. "Effective Sept. 28, 2007, the Outreach Resource Center (ORC) in Bdg. 1213, Rm. 139, was permanently closed. Due to budget constraints, the ORC is no longer available for walk-in customers or requests for hard-copy public information materials." "Come see some of NASA Langley's latest breakthroughs for yourself Saturday, October 27, from 10 a.m. to 4 p.m. Help stimulate your child's imagination with a look at real-life space-age discoveries that may one day be part of everyday life. Enjoy a rare opportunity to step back in time and view where astronauts learned to land on the moon." Editor's note: This sends a confusing message. On one hand LaRC opens itself up to the public - on the other hand it closes itself off from them. By Keith Cowing on September 11, 2007 5:59 PM. "This memorandum supersedes my August 1, 2007, memorandum to OICs and Center Directors. Its purpose is to clarify intent and provide guidance on how this messaging material might be used to the best advantage of the Agency. First, the original guidance was intended to provide some consistency on how we talk about NASA's work with the public. It is not a mandate and should not have been prescriptive. Second, the Core Message (NASA explores for answers that power our future) is not a slogan or tag line. You are not required to use it, but feel free to include it if you deem it appropriate and helpful for your communications needs. Third, the Graphic Element (Inspiration+Innovation+Discovery=Future) is a formula for those key themes that illustrate and enhance the Core Message. It should NOT be used as a graphic in Agency materials; however, the three themes can serve as a guide for Agency messaging. By Keith Cowing on August 30, 2007 8:14 PM. - MFR#137 - Consolidate all laptop/desktop/workstation procurement and support under ODIN"
By Keith Cowing on May 18, 2007 6:24 PM. Editor's note: Once again, it seems that NASA HQ and JSC PAO just cannot agree on whose version of a routine ISS status report gets released. Solution: they release both. Why the fuss? Well, JPL PAO complains that it cannot afford to give their employees cell phones with email capability (most kids walking home from Junior High have that) and other PAO organizations complain about looming budget cuts to other vital functions. Yet instead of trying to make their organization more efficient, PAO manages to find ways to make it less efficient. The following two versions of the 18 May 2007 ISS status report were issued within minutes of each other. The first one went out from JSC at 4:09:21 PM EDT. The NASA HQ version went out at 4:56:10 PM EDT. Continue reading Wasting Time (and Money) at NASA PAO. By Keith Cowing on May 17, 2007 2:42 PM. Editor's note: I just learned that JPL PAO media reps do not have the ability to get email 24/7. According to a JPL PAO source, JPL simply "does not have the money to provide Blackberry's to their staff". First of all, please tell me just how much that would cost for the PR employees of an arm of NASA (albeit a contractor), all of whom use nasa.gov email addresses, whose parent organization manages a substantial portion of NASA's space missions. What happens if news breaks (and it does) after business hours? Secondly: Earth to JPL: it is now possible to get email on Treos and handheld devices other than Blackberry's - even really cheap phones. Call Rent-A-Geek and they will set it up for you. Thirdly: for an entity whose amazing people can reach across billions of miles to reprogram 30 year old spacecraft now travelling outside our solar system, this has just got to be plain embarassing. You guys want to help build the Interplanetary Internet - and your PAO staff shuts off email after hours? Reader note: "Please do not post my name or email address, as JPL still shoots messengers. The JPL PAO excuse does not ring true. Virtually all JPL managers have, or have access to either Blackberries or Treos. The Treos seem to be more prevalent. Probably due to pricing. FWIW, almost everyone on my team has a Treo, and we are just worker bees. Also FWIW, it's inconvenient as hell to have a cell phone with a built in camera when you frequent places where cameras aren't allowed." Reader note (a veteran space journalist): "Some PAO at several NASA centers have the addictive blackberries. I'd say JPL PAO doesn't want them. They are, by far, rank lowest in returning phone calls and setting up interviews of any PAO shop I've dealt with across NASA or DOD or even private industry. NASA HQ comes in second, but I believe JPL PAO people think if they just ignore it, then it will go away. So, if they are "reachable" 24/7 (or more than they are now) then it will probably just go away." By Keith Cowing on May 16, 2007 3:27 PM. 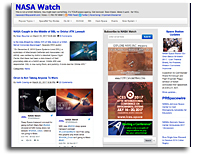 Editor's note: Have a look at the Winds website at NASA JPL. In the lower center of the page there is a link to "Lampson Concerned About Survival Of Vital Hurricane Tracking Satellite". Apparently (and I am giving them the benefit of the doubt here) the webmaster was unaware that his not an original "article", but rather, it is a press release from Rep. Lampson's office - someone who has been critical of the Bush Administration's space policies. If you go to this link there is nothing to note that it is indeed a press release, rather, it says what it was written by "staff writers". The full press release - labeled as such - can be found here at SpaceRef.com. Lampson's office has not put the press release online yet. I have asked JPL PAO and the responsible officials for this website what their policy is with regard to linking to external news sources and political press releases, but they have not responded. Indeed, they have updated this page since I initially sent my request. One would think that NASA's Office of Legislative Affairs would have some say in matters such as this. Editor's update: The website has been modified and JPL PAO says that indeed they were not aware that they were linking to a press release. Yet, the phrase "Lampson Concerned About Survival Of Vital Hurricane Tracking Satellite" now points to this LA Times article - one that makes no mention whatsoever of Rep. Lampson (D- TX) but mentions the comments of Ron Klein (D-FL) instead. Editor's further update: The link is now gone altogether. By Keith Cowing on April 17, 2007 7:12 PM. "Members discussed the need to know what audiences feel about NASA's relevance to their lives. Ames Center Director Pete Worden suggested that to communicate with younger audiences, the Agency needs to better use the internet and new communications technologies. Chief of Strategic Communications Sterner told members about plans to form cells in the mission directorates that will be responsible to incorporate Agency messages into the communications efforts undertaken as part of mission activities. The goal is to "get everybody on the same page." Sterner encouraged leaders to talk to their staff members who have responsibility for communications." By Keith Cowing on April 4, 2007 11:29 PM. "In interviews, McKinnon has admitted the hacking spree (though not the damage), which he says was a search for evidence of a military UFO cover-up. McKinnon, his lawyers and fans have portrayed him as a victim of overreaching U.S. prosecutors. They've all but claimed he's going to wind up with a pointy hood over his head." "Gary McKinnon, 41, yesterday lost his appeal against extradition to stand trial in the US on charges connected with hacking into the Pentagon and Nasa systems. He is accused of stealing computer files, intentionally causing damage to a protected computer, obtaining secrets which might have been "useful to an enemy" and interfering with maritime navigation equipment. He was initially arrested in 2002." Free Gary McKinnon, UK website for those who think this is so unfair and that this guy is heading for Guantanamo Bay. Editor's note: Silly Brits: everyone here knows that we send UFO exposers to Area 51 where memory sucking devices reverse engineered from alien technology reformat people's brains. By Keith Cowing on March 23, 2007 10:10 PM. "But Keith Cowing, editor of NASAWatch.com and a former NASA scientist, said cuts have prevented the agency from fulfilling its innovative outreach goals. "Everybody expects every agency to be hip and with it," but that takes time and money, he said. "The real problem is when they try" to meet these expectations, "Congress cuts their budget." "To their credit, [some officials] are actually getting hip to this," Cowing said. He pointed to NASA's Ames Center, where the agency is sharing computer scientists and office space with Silicon Valley neighbor Google." 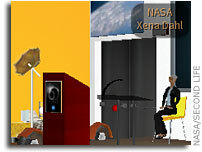 "NASA, the U.S. space agency, is getting ready to launch its own exploration into virtual space. NASAs Learning Technologies arm has issued an intramural call for proposal ideas [UPDATE: now postponed, oddly] for the development of a massively multiplayer online game that is intended to be the front-end of a larger synthetic environment." By Keith Cowing on August 29, 2006 11:53 PM. Editor's note: NASA has turned off all of its KSC webcams again. This is odd since you'd think that people would like to see damaage (or lack thereof) happens - in real time. Webservers and webcams normally run fine with little adjustment - so why not just leave them running?. Of course NASA could also look into installing some remote satellite webcams too. Again, they are not that difficult to set up and cost perhaps less than $10K per camera. Not much to spend when billions of dollars of assets are involved. Indeed, these two webcams [1, 2] operate autonomously on Devon Island less than 800 miles from the north pole - and conditions there can get rather nasty - for months at a time. Its odd that NASA hasn't set anything like this up. It sure ain't rocket science. What is even stranger is the fact that KSC's website has been shut down too. Now this is odd. Indeed, it is just plain dumb as well as unimaginative. I guess the notion of offsite hosting or mirror sites (on webservers outside of Florida) has never occurred to anyone at KSC. There are people at NASA who could keep an eye on things for a few days. So much for being able to post updates that KSC people who still have power - or have cellphones - can read. I have to wonder sometimes if NASA hires IT personnel who have ever worked in the real world. You'd think after all of these hurricanes someone might have learned a few lessons. Editor's 30 Aug 9:00 am EDT note: KSC's website is (apparently) operational again - but the webcams are not. Reader note: "Regarding webcams being turned off... My daughter is a senior at Florida Institute of Technology (Florida Tech) down the road in Melbourne. Their webcam is running as normal. Maybe KSC needs some FIT students to show them how to do it?" By Keith Cowing on July 25, 2006 4:46 PM. "In his new position, McManus will ensure that the agency's information resource management strategy is in alignment with NASA's vision, mission and strategic goals. In addition, he will focus on the development of integrated information resource management strategies, including standards, policies, the NASA Enterprise Architecture, IT security, management and operations." Editor's note: Gee, I wonder if HQ will give McManus control over Field Center CIO budgets such that he can fix things once and for all? By Keith Cowing on June 20, 2006 10:03 PM. Editor's note: Go to NASA SOMD's Human Spaceflight home page. Do you see links to the VSE, ESMD or anything connected to NASA's exploration efforts on that main entry point? Go the news page and you will see a similar lack of information on exploration. Now go to NASA's Exploration home page. There are no links to NASA SOMD's Human Spaceflight page - yet SOMD and ESMD are supposed to be working together to transition from current to future space systems. Oh yes - I don't see any links between ESMD's page and SMD's home page either - yet they are supposed to be developing hardware and science hand in hand. Indeed ESMD has created their own versions of pages that SOMD's website already has online. I find this continued stove piping and duplication of effort in terms of education and outreach, web design, etc. to be rather odd. Yet Mike Griffin tells everyone that exploration is what NASA is about and that SOMD, ESMD, and SMD are one big happy family. Alas, they can't even bother to link to each other's home pages. What does this say about how they really get along? This is just silly folks. By Keith Cowing on May 26, 2006 8:32 PM. "I am pleased to announce that the Office of the Center Director has created a blog. The purpose is to have a new and (we hope) effective tool for communication at the Center. The Deputy Director, the Associate Director for Institutions and Research, and I will use the blog to periodically convey information and to share important developments affecting the Center with you all. The "Ask the Director" link will also be available via this site." By Keith Cowing on April 7, 2006 3:57 PM. NASA's chief information officer and chief of Strategic Communications have outlined new policy governing all NASA public Web sites. This policy directs all NASA officials who are planning to publish new Web sites or create public content to host these sites and create and maintain their content within the NASA Portal infrastructure. Continue reading More PAO Website Orders. By Keith Cowing on September 21, 2005 10:44 AM. "NASA officials said the original e-mail's wording gave the wrong impression. "Unfortunately, we should have explicitly said that, by all means, people should continue to answer e-mails within their areas of expertise, but we did not," Dunbar said. "It was never anyone's intention to muzzle anybody or restrict information from going out to the public." Editor's note: It has been nearly a month. Has NASA clarified this issue - by memo - to all of its employees? No. By Keith Cowing on July 8, 2005 7:00 AM. Editor's note: Why doesn't this page, this page, this page, or this page at NASA's Human Spaceflight website (run by JSC) link to this page (run by NASA MSFC) - all of which have to do with the ISS and tracking its current location? Continue reading JSC vs MSFC website silliness. By Keith Cowing on May 30, 2005 8:46 AM. Editor's note: After nearly a decade of being available online, NASA HQ's web paranoia has led to NASA Heads-up being restricted to NASA employee viewing only. Alas, we will no longer be able to know about blood drives, costume parties, and employee picnics any more. Here's an example of what was once available. This is really silly and echoes the way things were done in the Goldin era. Editor's update: I have sent Griffin's new strategic communications guru, Joe Davis, a request for an explanation for this action. No reply received - yet. By Keith Cowing on September 13, 2004 11:52 AM. "+Official NASA Public Portal Affinity Kit - Comprehensive and authoritative guide for creating sites that have affinity with the NASA Public Portal. 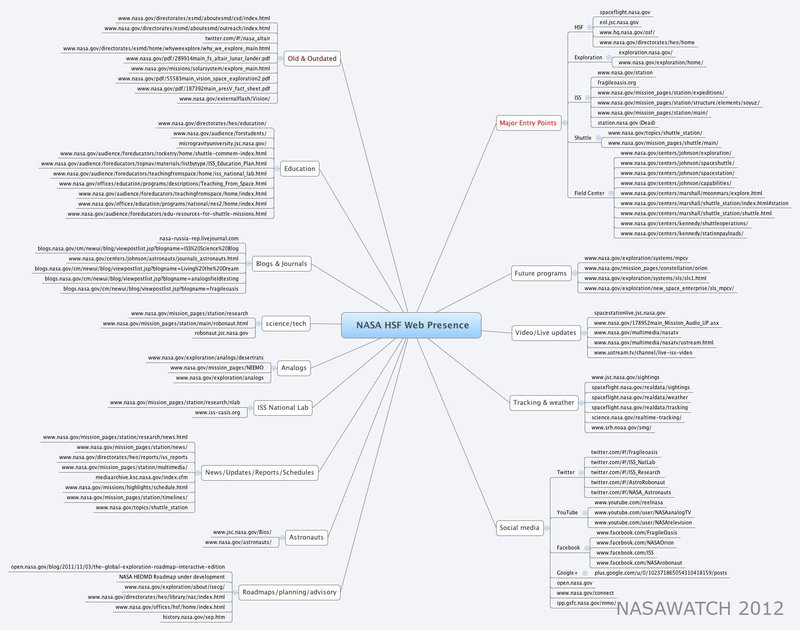 +NASA Public Portal Integration Plan - The proposed plan for integrating various NASA web sites with the Public Portal." By Keith Cowing on September 9, 2004 12:19 AM. "With Florida facing the possibility of its third hurricane in a month, NASA is putting together a backup plan for its message system based on Research in Motion Ltd. BlackBerry devices. They are working on a workaround system for BlackBerry service," Melissa Mathews said. "It's like [instant messaging] but doesn't involve networks." Editor's note: Excellent! At least someone at NASA knows how to use state of the art, well-established, real-world solutions - and to do so quickly, and without a lot of paperwork. By Keith Cowing on September 8, 2004 12:01 AM. "The Process Control Center had severe water damage after losing part of its roof. It's the hub of the e-mail and Web system for the shuttle launch complex, but because the computers were covered with plastic, the damage assessors think they probably were protected, KSC Director Jim Kennedy said." Editor's note: Housing a webserver, email server - or any vital computer network hub in such a fragile location "covered with plastic" is just nuts. The fact that this facility is a few miles from the ocean, a few feet above sea level in a state prone to tropical storms and hurricanes makes me wonder just what the KSC folks were thinking - especially in a post 9/11 world. I certainly hope NASA is going to catch up with the rest of the world and have secure, offsite mirror web facilities - such as those commonly used in the private sector. These armored, windowless facilities have uninterruptible back-up power, as well as server and connectivity redundancy. Fortunately, I understand that this storm has led to some definitive movement to fix this situation as NASA continues to develop its new web portal infrastructure. This page is an archive of recent entries in the Internet Policies category. India is the previous category. ISEE-3 is the next category.